NY Times reports that an Iraqi scientist is suddenly talking, and saying that Iraq had chemical and biological weapons, but destroyed them a few days before the war. That sounds a bit overly convenient for Bush. Both justifying the war and also justifying why none of the purported 'weapons of mass destruction' are being found. Very clever. Oh, it might be true, but that would have been extraordinarily non-sensical from Saddam's perspective. And what's with not being able to find Saddam Hussein? If they end up not finding him at all, I'd say there's a pattern forming here. Osama bin Laden was enemy number one, as the supposed mastermind of 9/11. For months everything was about him. He's here, he's there, maybe we got him, maybe he's dead, blah, blah. And suddenly nobody pays any attention any longer, despite that he wasn't found and probably isn't dead. Same thing with Saddam Hussein. If they don't find him, and the media suddenly loses interest, I'd say something very sinister is going on. It was simply a matter of George W. being business partners with Osama bin Laden, and with Saddam Hussein. Shouldn't be much of a stretch, as his Dad pretty much hired them for their jobs in the first place, as CIA director. So, they did their scripted part, and we have a phoney chase trying to find them for a few months. And then they go into the equivalent of the witness protection program. They get plastic surgery, new passports, a few billion in a bank account, and spend the rest of their lives in underground palaces in Bora Bora. Or they moved on to the black government's bases on Mars for all I know. 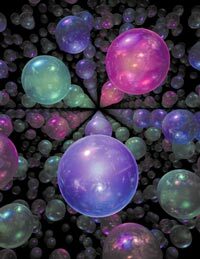 Paul Hughes posts an article by Max Tegmark about several different possible models for the multiverse, involving various scenarios of parallel realities in one form or another. Fascinating reading. "So should you believe in parallel universes? The principal arguments against them are that they are wasteful and that they are weird. The first argument is that multiverse theories are vulnerable to Occam's razor because they postulate the existence of other worlds that we can never observe. Why should nature be so wasteful and indulge in such opulence as an infinity of different worlds? Yet this argument can be turned around to argue for a multiverse. What precisely would nature be wasting? Certainly not space, mass or atoms--the uncontroversial Level I multiverse already contains an infinite amount of all three, so who cares if nature wastes some more? The real issue here is the apparent reduction in simplicity. A skeptic worries about all the information necessary to specify all those unseen worlds. A common feature of all four multiverse levels is that the simplest and arguably most elegant theory involves parallel universes by default. To deny the existence of those universes, one needs to complicate the theory by adding experimentally unsupported processes and ad hoc postulates: finite space, wave function collapse and ontological asymmetry. Our judgment therefore comes down to which we find more wasteful and inelegant: many worlds or many words. Perhaps we will gradually get used to the weird ways of our cosmos and find its strangeness to be part of its charm. Heheh, that's the cool part. Somebody who proposes anything other than this wonderful infinite unified multiverse will have some serious explaining to do, as to why things would be only that one particular way, rather than ALL ways. I think I'm going to chuckle the rest of the day.